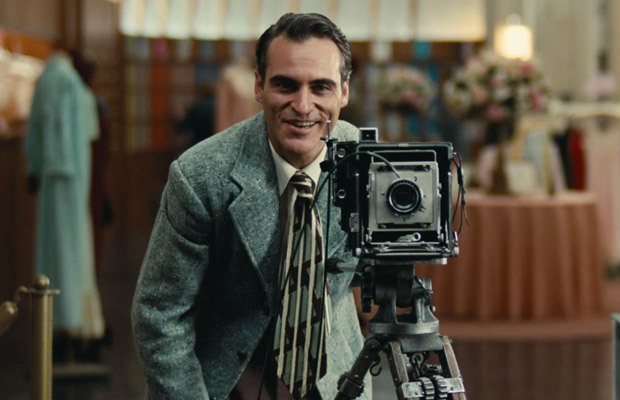 The reaction to Paul Anderson’s ‘The Master’ was a curious pathway across a full spectrum of emotions, if you believe what is published in the Internet. As a movie lover I enjoy reading all these reactions, what I haven’t found was anyone to discuss the movie with face to face—it just didn’t seem to attract any of my real world friends to the cinema and that is a shame. Maybe they are waiting for the blue-ray release, that is also a shame. Home viewing will be a shadow of the actual movie experience. This is unashamedly, what is often referred to as an Art House movie, and if you couldn’t find an ‘art house’ then a high brow multiplex (?) was a necessity to enjoy the movie in its intended 70 mm film format. There is a widely echoed sentiment that the movie doesn’t have a narrative and at 144 minutes it runs too long. Well, I will admit that the film is heavier on character than plot, but with Joaquin Phoenix and Philip Seymour Hoffman in front of the camera I’m not going to complain. The strength of their performances individually and synergistically add of to a plot all on their own. Conventional wisdom seems to want a plot to consist of a series of questions followed by answers. Well it isn’t happening here. 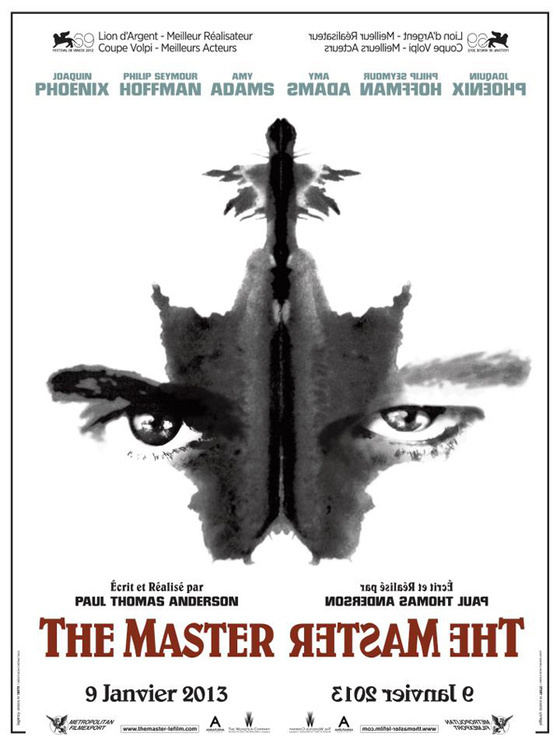 The structure of ‘The Master’ seems to hinge on letting you guess the questions and then supply your own answers. As for the running time, the pace never seemed to drag to me and it left me wanting more at the end. I’ve seen plenty of 90 minute movies that fail this test. The movie centers on the relationship between a troubled former soldier, Freddie Quell played by Joaquin Phoenix in a gripping and extremely mannered style. His refusal to look for sympathy in his role is reminiscent of Daniel Day Lewis in Anderson’s last movie ‘There Will Be Blood’ and I found it very refreshing. Phoenix puts the Trauma into this exploration of post traumatic stress, set in an era when the syndrome was barely known or acknowledged. Quell finds an uneasy balm to his psychological terrors in his mysterious and ‘uber-potent’ alcoholic concoctions and also in his uneasy relationship with Lancaster Dodd, the enigmatic Master of the title. There are no easy answers for Quell’s inner demons but Dodd happily experiments with his own brand of improvised quasi-brain change. Every potential biologist/scientist needs guinea pigs. 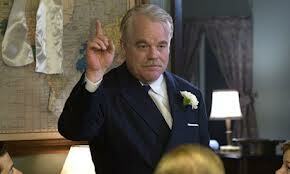 Freddie Quell is played with a smoothly charismatic brio by Philip Seymour Hoffman. He may be making up the game and the rules as he goes along, but he never seems in doubt of the end result. This is a false assumption when it comes to Quell, who never finds his centre of gravity through their relationship. Much has been made of the fact that Hoffman’s character was based on L.Ron Hubbard, the creator of Scientology, and this is certainly a major factor in the movie. However, there is a much bigger model for the lead character’s relationship in Anderson’s screenplay. The movie would probably have been a much bigger commercial success if it had been a simple expose of Scientology. The movie takes a much larger scale and it addresses the relationship between all ‘Seekers’ and the ‘Master’ they attract into their life. 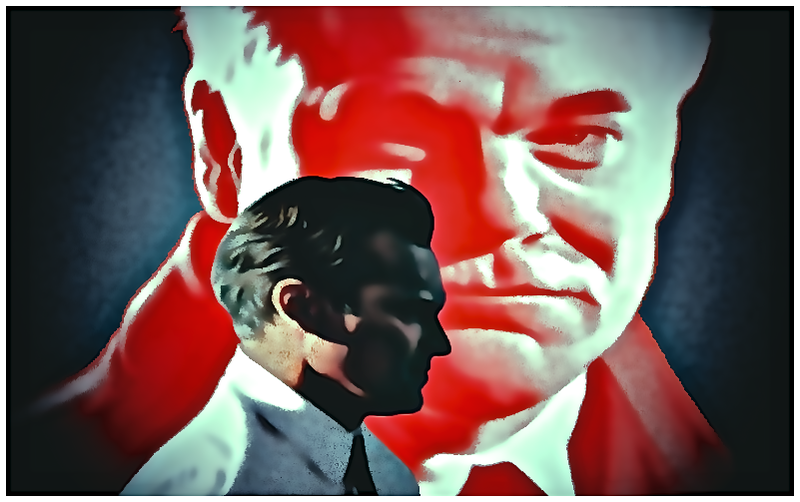 If I had to make a guess about Anderson’s mechanics in his visualization of the story, I would say he very consciously based his Quell/Hubbard relationship on the way Orson Welles took Randolph Hearst as his starting point for his Charles Foster Kane character in ‘Citizen Kane.’ Both directors blended fact and fiction to create a myth attached to an obviously real world character. In many ways I saw an equally valid role model for Quell in G.I. Gurdjieff the Greek/Armenian Master who practiced a curious blend of techniques in Russia and France during the middle decades of the last century. Quell calls his teachings/path ‘The Cause,’ Gurdjieff ‘The Fourth Way,’ and Hubbard ‘Scientology.’ Would/do any of them work? The answer is probably a qualified yes, but only if the seeker approaches his chosen ‘Master’ with the necessary belief to fuel the changes he needs to make. Belief is at the heart of the seeker/Master relationship. A solid, bold and all encompassing belief that creates a magnetic bond through which change is made possible. This kind of devotional belief in another individual comes hard to the American psyche but is at the heart of many Eastern religions/philosophies. Generally the healing is accomplished when the Seeker finds the strength to leave his master after discovering the blend of truths and trickery that his ‘Master’ has used to ensnare him. In this movie Quell can’t quite invest enough belief in his Master to fully realize the recovery that he longs for. Maybe he has been around Dodd for too long and is just too aware of their shared weakness’ and contradictions. After all, Quell and Dodd drink the same alcoholic Kool-Aid—and Quell is the one who prepares the brew. This is a full-blown cinematic voyage into a nebulous area of human relationships. It has no easy answers and no easy questions, it just allows you to watch two magnificent actors depict a curious relationship under the microscope of the camera. The screenplay may allow for some existential Rorschach testing on the part of the viewer. I suspect that it is going to be an ever increasing aspect of Anderson’s role in contemporary cinema to ensure that his viewers are free to take away as much from his movies as they bring to the table to begin with. It sounds like a fair and challenging deal to me. All the technical aspects of this movie are meticulous and beautiful to watch and listen to. 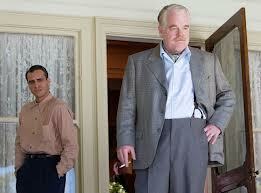 Paul Anderson had a first class role model and mentor with director Robert Altman. However much I loved Altman’s movies, you could never apply the word meticulous to them, not with a straight face. Anderson gives a nice idea of how the relativism of Altman’s movies would look if they were directed by a contemporary artist/scientist. One trait that both directors revel in, is their refusal to make movies for anyone but themselves—no movie making influenced by studio suits for these two mavericks. I see Anderson as a bearer of a sacred flame, and await his next release eagerly. ~ by Nick Lewin on January 5, 2013.